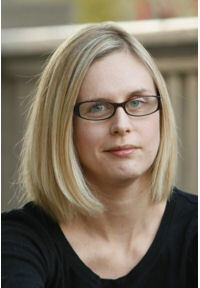 Louise Krug grew up in Michigan and attended the University of Kansas in Lawrence, graduating with a BA in journalism. After undergoing two craniotomies at the Mayo Clinic to remove a cavernous angioma, she gradually regained the ability to walk and use of her right hand. In 2005, she returned to Lawrence, where she has since graduated from the University of Kansas with an MFA and a PhD creative writing. She now is an Assistant Professor of nonfiction writing at Washburn University in Topeka where she lives with her husband and two children. While recounting these problems I begin to cry and cannot stop, even after she cradles me for a second, after she lifts me onto a bed to wait for the doctor. This isn't supposed to be happening, I think. I've only been in California for two months. Right now I'm supposed to be at my first day of work, as a reporter for a local paper, my first job out of college. For the interview I'd bought a form-fitting striped pantsuit and crocodile stilettos. On the way to the interview I'd stopped for a latte and a business magazine and felt smart and adult. My answers had come out of my mouth like someone had pressed a button. The editor had sports analogies for me. He wanted a reporter who would hit home runs and catch fly balls with the sun shining in their eyes. I said I could. I'd spent a hundred dollars on makeup and learned how to apply it on a department store stool and it had obviously been worth it. The doctor starts giving me reflex tests, tapping my knees with a little hammer. I can see that my right side is not reacting as it should. He tells the nurse to order an MRI. I tell myself I will soon be out of this emergency room and on my way to work. After all, it is a sunny Monday in California. Nothing bad can happen here, the weather is too good, the people, too rich. Louise was all done with the surgeries to try to make her crooked eye straight, done with the operations to make the paralyzed half of her face move. She no longer went to the plastic surgeon to get Botox injections, stopped talking about seeing a specialist in Philadelphia. She had moved on. Almost. "This is the last thing I need to do before I'm done with doctors completely," she told Nick. "This is the very last thing." She knew one ear worked better than the other. She always tilted her head with her good ear up and forward when speaking to someone so she would be sure to hear them best. It looked like she was posing for a picture. She was getting tired of saying "I know!" (the safest answer) to some words she couldn't understand, of settling back in her chair and letting the others at a restaurant table wind the conversation where they wanted to, of her inability to distinguish all the voices from the background music, the din of dishes, the argument at the next table. There were the mumblers, the quiet talkers, the fast talkers - she never uderstood much of anything they said. She loved loudmouths. But she wanted to give herself a chance.